Spotify is now an iPad app. "About flipping time", most of you will be saying. However, on first glance, it appears that this may have been worth the wait. It's finally here. 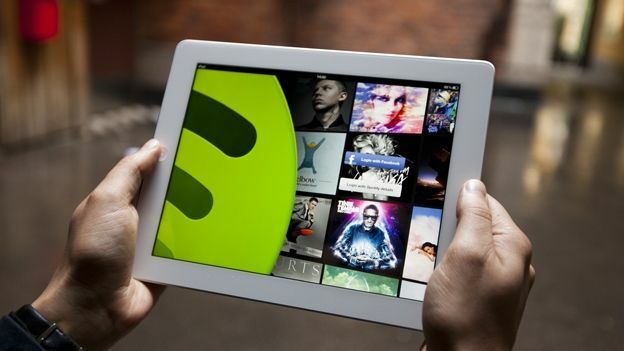 Spotify for iPad has officially launched with a brand new tablet-friendly user interface and AirPlay integration. The application, which brings access to the full range of 17 million tracks, appears to be the one leaked a couple of weeks ago, featuring the layered UI that's looks a little more like Twitter for iPad than Spotify for iPhone. On the left hand side of the page are the Search, What's New, Inbox, Playlists, People and Settings tabs, and hitting one of those populates the remainder of the screen. Extra layers, such as the play screen or more in-depth searches are sent out to the right, while it's easy to swipe between the layers. Spotify for iPad has been optimised for the new tablet's impressive Retina Display with full resolution HD cover art able to engulf the whole screen. AirPlay integration means you'll be able to beam your favourite music around the house to your AirPlay-enabled speakers or Apple TV box. The app is naturally endowed with plenty of social flavour. Your Spotify-using Facebook friends are all-aboard, if you've linked your account and it's easy to share with social networks and check out the music that's trending through the #NowPlaying hashtags. Naturally, you'll need a £9.99 a month Premium account to listen any music, but you can download and browse the app's new features without putting your hand in your wallet. The lack of an iPad app has been a major stumbling block for those thinking about handing over a tenner a month to the Swedes. Will this finally have you reaching for the credit card? Check out the lavish promo video below, including the confident little jest at the beginning. Nice touch.